What's memorial day without a full rack of ribs? The key to those perfect, fall-off the bone ribs comes from baking them before throwing them on the grill. Slow and steady wins the race with these BBQ Baby Back Ribs! Finish off with a bottle of any of our three Medmont Mercantile BBQ Sauces for an irresistible dish! 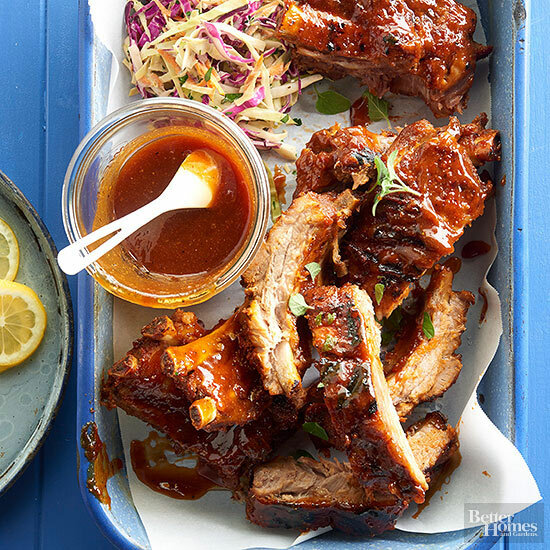 This recipe is an adaptation of the recipe for Oven-to-GIll Baby Back Ribs! Preheat oven to 375 degrees F. With a pastry brush, spread the mustard all over both sides of the ribs. Generously sprinkle the rub all over both sides of the ribs. Place ribs in the middle of a double thickness of heavy foil cut 6 inches longer than the ribs. Wrap ribs in the foil. Bake for 1 1/2 to 2 hours or until tender (the two middle bones of the rack should start to pull apart easily). Remove ribs to a tray (discard liquid in foil packet). Spread the sauce all over both sides of the ribs. Grill on the rack of a covered grill directly over medium heat for 15 minutes, brushing with additional sauce every 5 minutes, turning once. Adjust heat as necessary to prevent burning. Shred and serve on Sea Salt Crostini's if you'd rather serve it in a bite size way!